We cook a really nice big wing and add whatever sauce you would like. We have honey garlic, BBQ, Sweet Chili with Heat, 2nd Degree, Buffalo. 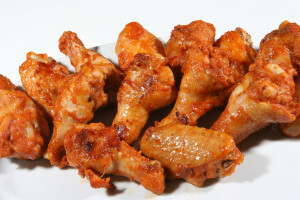 You can get a wings (4) n' wedges meal deal for $6.00; wings only in 6 pack, 12 pack, 24 pack, or wedges only. If you pre-order a minimum of 24 wings prior to 3pm on Thursday, you get FREE garlic bread with your order. Call ahead 519-353-3700 so you are not disappointed. Sometimes we run out of wings.